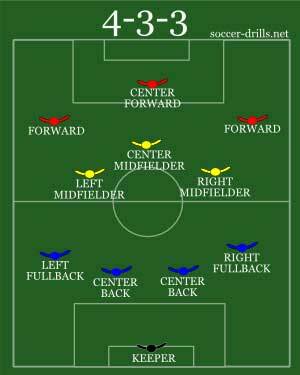 A soccer formation, in its simplest term, is how the team is positioned on the field. 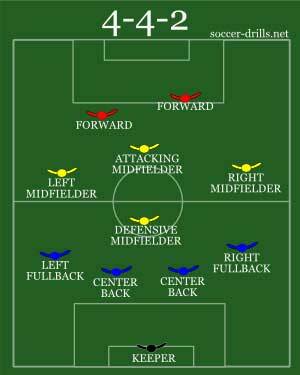 There are many formations in soccer that focus on attacking, defending, possession, overloading the midfield or a balanced formation. Finding the right formation for your team will be the key to the success of the team. No, there is no silver bullet when it comes to formations in soccer, so it will be important for your team to learn a few key formations. One formation will work great against one team, and not be effective at all against another. The key to finding the right soccer formation is to know your opponent’s strengths and weaknesses and appropriately match up a formation based on your own team’s strengths and weaknesses. Some of the most common soccer formations for youth soccer teams are the 4-4-2, 4-3-3, 3-4-3, and the 3-4-2-1. The 4-4-2 soccer formation is made up of four defenders, four midfielders and two attackers. Because of the number of defenders and midfielders, they are able to cover the width of the field ane are able to attack and defend. The midfield can be made up of two central players playing beside each other, or one attacking midfielder and one defensive midfielder. The outside midfielders play out wide and are responsible for joining the attack and getting back on defense. The outside fullbacks must be able to attack from the back and should possess speed as well as good short passing as well as long passing. They should have a good idea of when to attack, and when to retreat. These players must be fit and have a high work rate since the success of their position will be determined by being able to get up and down the field. The center back, often called the stopper, must be a strong presence and be able to win 50/50 balls. They should also be good headers and be able to play with both feet. This player typically stays around the middle of the field in the heart of the defense. The sweeper must know the game of soccer very well. It is typically this player that starts building the attack from the back and must be able to play smart. Whether it's playing to his outlet player on the wing, or switching the ball from one side to the other, this player must be a skilled dribbler, good passer, have speed on and off the ball, and be able to tackle. The 4-4-2 soccer formation is one of the most common formations because it has a balanced defense, solid midfield, and can produce a good attack. The 4-3-3 soccer formation is made up of four defenders, 3 midfielders, and 3 forwards. The 4-3-3 is another one of the common formations because it allows for a balanced defense, however, this soccer formation adds another attacker up front. This formation is often used as an attacking formation that allows more offensive players to get in the opponent's box.